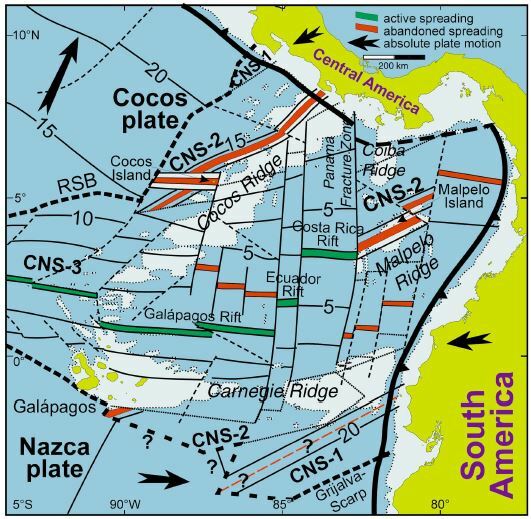 The formation of the Cocos Plate resulted from the breakup of the Farallon Plate at approximately 23 Ma (caused by the East Pacific Rise) when it split creating the Cocos Plate and the larger Nazca Plate to the south of the spreading center. (Manea et al. 2013). Dougherty, Sara L., Robert W. Clayton, and Don V. Heimberger. "Seismic structure in central Mexico: Implications for fragmentation of the subducted Cocos plate." Journal of Geophyssical Research. 117. (2012): 1-17. Web. 16 Jan. 2014. Manea, V.C., M. Manea, and L. Ferrari. "A geodynamical perspective on the subduction of Cocos and Rivera plates beneath Mexico and Central America."Tectonophysics. 609. (2013): 56-81. Web. 16 Jan. 2014. Mechede, Martin, and Udo Barckhausen. "PLATE TECTONIC EVOLUTION OF THE COCOS-NAZCA SPREADING CENTER." Proceedings of the Ocean Drilling Program, Scientific Results. 170. (2000): Web. 16 Jan. 2014. Perez-Campos, Xyoli, YoungHee Kim, and Allen Husker. "Horizontal subduction and truncation of the Cocos Plate beneath central Mexico." Geophysical Research Letters. 35.18 (2008): Web. 16 Jan. 2014. Sadofsky, S., K. Hoernie, S. Duggen, F. Hauff, R. Werner, and D. Garbe-Schonberg. 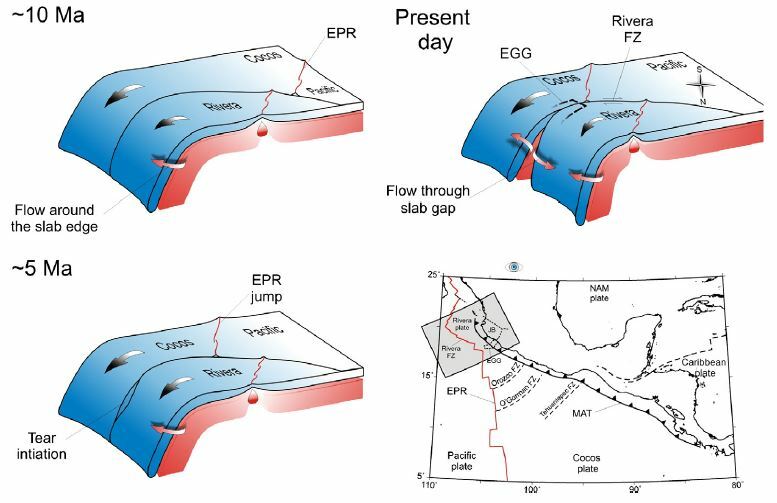 "Geochemical variations in the Cocos Plate subducting beneath Central America: Implications for the composition of arc volcanism and the extent of the Galápagos Hotspot influence on the Cocos oceanic crust." International Journal of Earth Sciences. 98.4 (2009): 901-913. Web. 16 Jan. 2014.